Editor’s note: this is part two of a three-part series documenting Romero’s career, spanning his early days as a teenage coder for the RAF, through the id era and up to present day. With thanks to Yorkshire Games Festival. Wolfenstein 3D had a prolonged development by prior id standards. It took four months for the studio to get ready for a shareware launch of the first set of levels; two more to finish all six episodes and a hint book. But the unprecedented effort proved worth it – Wolfenstein 3D was fast and breathless, thanks to John Carmack’s decision to strip his engine back to a single plane, and sold 4,000 copies at $60 in its first month. Related: the best PC first-person shooters. The money was poured into new computers. Until now, id had been working on the same DOS PCs their games were designed to run on – but they knew they could do better with more powerful machines. Their next project would be made on NeXTSTEP workstations, the ancestors of today’s MacOS, and would be named Doom. John Carmack’s D&D games had become a fixture of life at id, and his campaigns were full of demons. The creatures had wormed their ways inside his friends’ heads, into Adrian’s drawings and Romero’s designs. Alongside Evil Dead and Aliens, they would wrap their tendrils around the design of Doom. While John Carmack set to work on a new 3D engine and AI, Tom Hall wrote the Doom bible. Romero implemented it, stripping out a bunch of stuff that “didn’t matter”. Using the powerful DoomEd, levels could be tested and revised at breakneck pace, leading to Romero’s inimitable style of FPS design. He would play his levels thousands of times during their creation, restarting every time he modified a room or dropped something new into it. 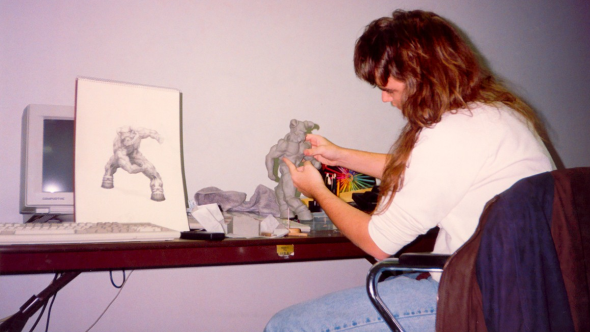 Adrian Carmack builds a clay Baron of Hell to be scanned into Doom. The result was a sense that every playthrough of a map was a personal encounter with its creator. As if Romero or Sandy Peterson – a veteran designer who was brought on midway through development after Hall’s departure over creative differences – were watching the player. Toying with them like a particularly devious Dungeon Master. The hiring of Peterson and Dave Taylor had brought id up to six staff, but the workload was heavy. The studio had taken on Wolfenstein 3D’s Super Nintendo port right in the middle of development, and none of the team knew how to program the SNES. Three educational weeks later, however, they were back to work on Doom at full-strength. 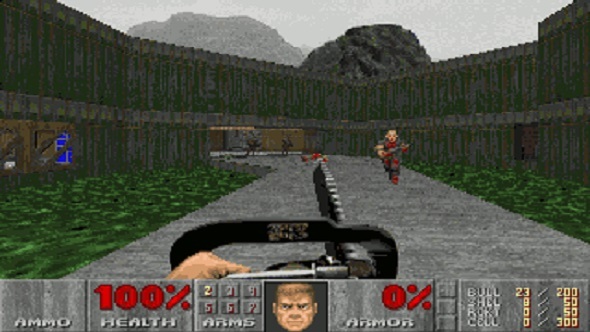 “During the final day of Doom’s creation we worked 30 hours,” claims Romero – meaning that although the team had the game running on every computer in the office, John Carmack was busy fixing a last-minute freezing bug without disturbing any of them, solving the issue entirely in his head. By the time id uploaded the shareware version of Doom to the University of Wisconsin’s server on December 10, 1993, the anticipation was electric. Fans were phoning into the office to find out when the game would be out, and creating files in the upload directory with names like ‘when.will.we.see.doom’. Being into Doom was like being into a band. And if they listened really carefully, superfans could almost hear the individual voices of each designer in id’s levels. 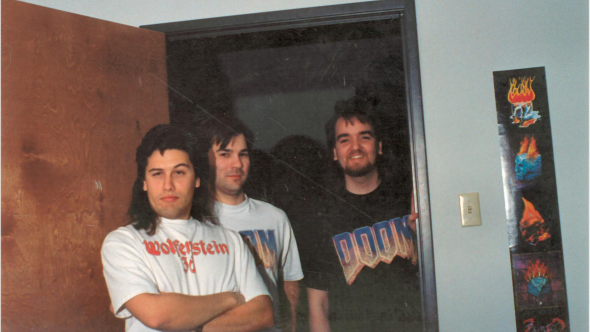 id put together Doom 2 in eight months during 1994, and started work on Quake the following year as a team of nine: four designers, three coders and two artists. 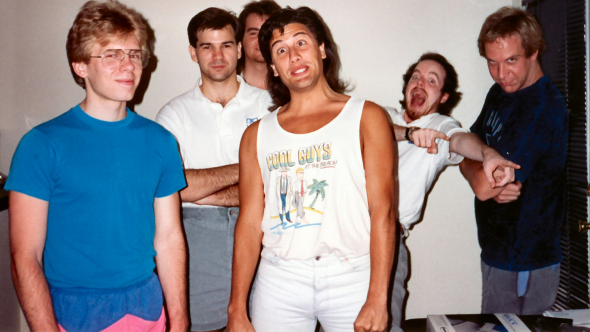 L-R: John Carmack, Kevin Cloud, Adrian Carmack, John Romero, Tom Hall, Jay Wilbur. John Carmack jettisoned all of Doom’s code to build the new Quake engine, drawing on the rasterisation wizardry of Michael Abrash – now chief scientist at Oculus VR. In fact, the production of Quake would kickstart the career of more than one industry gamechanger: John Cash, who provided Quake’s network code, went on to become lead programmer of World of Warcraft. Romero, meanwhile, wrote a new level editor and began experimenting with design in full 3D for the first time. Determined to develop on more powerful PCs than ever, id made a deal with Cray Supercomputers to buy one of their machines for half-price. The plan was that id would plug the monster PC into Quake’s lighting and crunch new kinds of data. In return, the studio would fill a computer room in Quake’s DM3 level with Cray’s logo. The deal fell through, however, when Cray were bought up by another company. 14 months after development had begun, id released Qtest. And four months after that, at 5:30pm on June 22, they pushed shareware for the finished game onto the University of Wisconsin’s site. 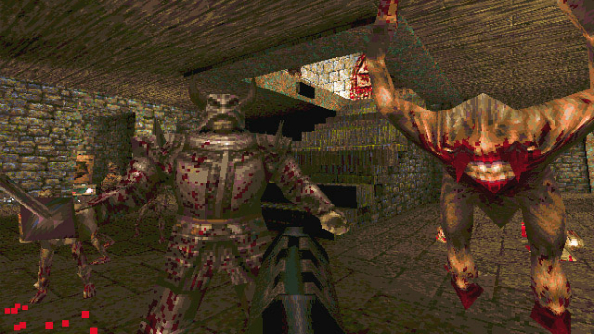 Quake, lest we forget, introduced the world to mouse-look and high-speed worlds in true 3D. And when QuakeWorld came out five months later – improving the lot of players on dial-up modems – it birthed internet multiplayer with the clans and tournaments we’ve come to expect today. id Software had put out 28 games in five years, delighting and outraging America while reaching far further via the magic of shareware. “Making games was our life,” says Romero. But already, the seeds were sown for breakup. Part three covers the downfall of the id dream team, the notorious Daikatana and the new Doom.